From the Hancock County Courthouse, take Highway 16 east to Jewell. Turn left (north) on the Jewell-Mayfield road. Go approximately 1-1/2 miles to a yellow bar gate on the left. Go through the gate and proceed approximately 1/4 mile. 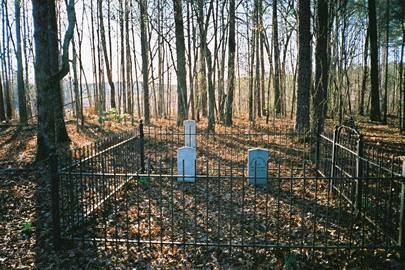 Cemetery is located in the middle of a 3 acre wooded track on the left side of the road. The cemetery is located on the property owned by Plum Creek Timber Lands. Company B, 28 Ga Inf. Company H, 2 Ga. Inf.